For those of you who spend a fair amount of time gaming, you’re probably quite familiar with dirt build up on your controllers. Conversely, if you don’t game that much (I may ask why you even have a gaming console at all), then you’ll undoubtedly notice a thick film of dust build up on your controllers. Whichever side of the fence you sit on, there is a solution to your cleaning needs in the form of Dirt Rags Gaming Wipes. 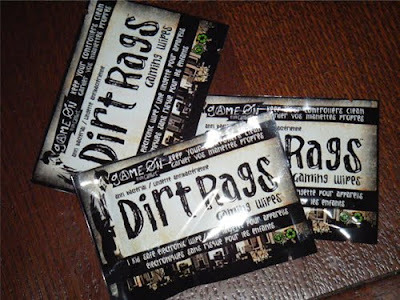 Manufactured by Game On (Cambre Products), Dirt Rags are “kid safe” wipes that can be used to clean your precious controllers as well as other electronic devices including iPods, cell phones, digital cameras and GPS devices. What’s great about Dirt Rags is that they contain no toxic chemicals. There’s no alcohol, phenol or bleach. 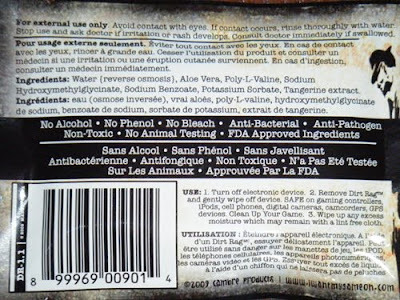 In fact, the actual ingredients as printed on the label are water, aloe vera, poly-l-valine, sodium hydroxymethylglycinate, sodium benzoate, potassium sorbate and tangerine extract. When you open up a package, you get one generously sized wipe – very similar looking to those hand wipes you get at bars along with your order of chicken wings. The wipe itself is sturdy and fairly thick with just enough moisture that when you use it, it’s not unnecessarily flooding your device when you clean it. To put the Dirt Rag to the test, I decided to give one of my Xbox 360 controllers a good wipe down. The wipes work quite well and the cleaning agents contained within do a great job. This means that there’s no need to aggressively press down with the wipe against the surface of what you are cleaning. A harder test came when I got to my controller’s triggers. 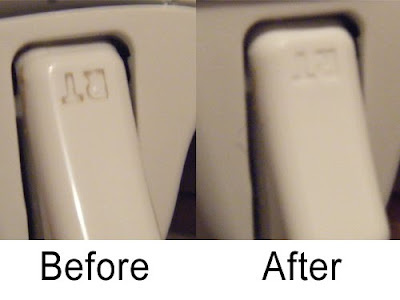 As you can see in the before and after picture, the wipe was quite effective in removing the dirt that had accumulated in the indented trigger letters. Once again, all it took was a few mildly pressured strokes and the dirt was gone. I also used the same wipe and cleaned a few other devices such as my tv remote and Blackberry. As expected, it cleaned these very well. Currently Dirt Rags sell in either 8 pack or 25 pack sizes and sell for approx. $3.99 and $9.99 CAN respectively. The 25 pack obviously being the better deal as it works out to approx. $0.40 per wipe. A great value for a very good cleaning wipe for electronics. Based on its effectiveness, non-toxic properties and great value, I would recommend Dirt Rags to anyone looking for a good alternative to cleaning their game controllers and other electronic devices. In terms of where to buy Dirt Rags, Game On’s website lists the following retailers in Canada: Future Shop, Walmart Canada, Canadian Tire, The Source, Dell Canada, Amazon.ca and Andre’s AudioTronic. For more information on Dirt Rags, visit Game On’s website at www.iwantmygameon.com. I usually use rubbing alcohol and kleenexes, and they've never done me wrong. Especially when buttons get sticky crap on the inside, the alcohol burns it right out. any idea if theyre safe to use on (touch) screens? Lenses? I hadn't tried them on my iPod Touch or my camera lens. However, since it does state these wipes are ideal for cleaning both and that there are no toxic chemicals contained, I would likely assume it's safe to use screens or lenses.